A couple of weeks ago, my wife Rachel and I flew to the USA for two conferences. 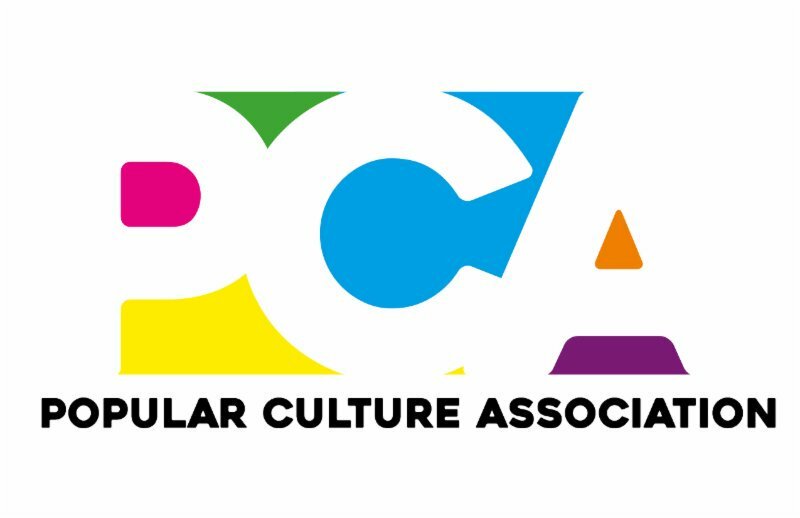 The first was the Popular Culture Association‘s National Conference, held in Indianapolis this year. Presenting and attending PCA was a very exciting experience, which is not something one can say about all academic conferences. They cover a wide variety of subject areas, some quite quirky, and Rachel and I were part of the Gay, Lesbian, and Queer Studies section. Our paper was on the representation of queer and gender diverse people in popular culture and how this impacts on young people. Our panel included Joseph Lloyd Donica, assistant professor of English at Bronx Community College of the City University of New York, and Elliot N Long, who presented fascinating papers. There was a great turn out and very interesting questions, including a discussion of the recent film Call Me By Your Name. Apart from our own presentation, we attended a variety of panels (including one on The X-Files and another on Buffy the Vampire Slayer – our dream popular culture topics) and a film screening of Logan’s Run, a seventies sci-fi film that we unexpectedly enjoyed. Just over a week later, we headed to a very different kind of conference: ClexaCon: a Media & Entertainment Convention for LGBTQ Women and Allies, held in Las Vegas. The event is named after Clarke and Lexa from The 100, but is a multi-fandom event exploring queer identity and shipping in popular culture. 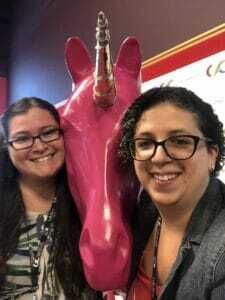 We attended with our dear friend Sharon Angelici, who was a volunteer at ClexaCon and wrote about the experience on her blog. We had a wonderful time, meeting new friends and some celebrities, and had a really positive experience as panellists as well. Our panel – Countering the impact of heteronormative and cissexist media on young people – consisted of Rachel and myself, Elaine Atwell and Amy Spalding. The room was packed, with standing room only, and we had a very engaged audience ask a number of questions at the end. It seems that many people in the LGBTIQA+ community are passionate about representation and making the lives of queer and gender diverse young people better than what we experienced ourselves. During the postal survey on marriage equality, both the ‘yes’ and ‘no’ campaigns often used trans and gender-diverse people to make a point. Our sexual preferences, clothing, mental health and genitalia were discussed in the media but also by supposed friends and allies, often in offensive, exploitative and harmful ways. I figured it was time to write about being non-binary and genderqueer. I wrote a piece for SBS Sexuality, and hope that it helps illuminate the experience of being gender-diverse for those who don’t understand, as well as being validating for those who have had similar experiences to mine. It is not a guide to non-binary identity, and I don’t go into detail about my realisation or pronouns. I’m happy for people to contact me, and appreciate those who have shown their love and support. A few months ago, someone asked me to describe my gender using a gif. I knew what I wanted it to be immediately: Ilana Glazer dressed in a suit, grooving out and ignoring the surrounding chaos. So here is that gif, and I think it says a lot. I’m very excited to tell you that my essay ‘Out of the closet’ has just been published in The Big Issue Australia. 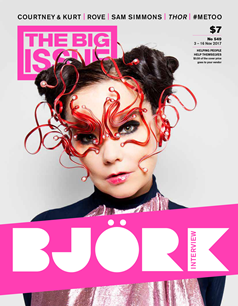 It’s particularly thrilling because this issue includes interviews with Björk, Courtney Barnett and Kurt Vile, director Taika Waititi (Hunt for the Wilderpeople) and other awesome writers, musicians and comedians. While the title of my essay might suggest yet another piece about coming out, fear not. It is about the fact that Rachel and I have now been married four times – yet our marriage is still not legally recognised in Australia – and plan to get married a fifth time in 2018. Australians, please don’t become complacent about the marriage equality vote. It isn’t the most important issue going on in the world, clearly, but it still matters. 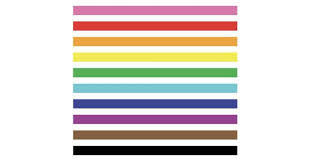 You can advocate for marriage equality and for all the other issues you care about. I will be reminding people of these other issues once the survey results are released on 15 November and I have celebrated/cried enough. If you are a straight ally and have been helping: THANK YOU! We couldn’t do this without you. It has been an awful time for our community, and I truly appreciate your support. It might be worth considering if there are any other ways you can help at this point, beyond talking to your communities, putting up posters, etc. If you are straight and generally pro marriage equality but haven’t done much or anything at all, please think about why. Are you actually pro marriage equality? If you’re voting no, that’s your prerogative. But if you are voting or have voted yes, and want your queer family/friends to have equal marriage rights (and I assure you, you have queer family and friends whether you know it or not), we could really use your help. Send me a message if you are unsure what to do next. If you are afraid to ask your family members what they are voting – and this is something many people have told me that they feel – please message me and I’m happy to provide tips on how to approach it. Little did I know that Mary would be coming to Sydney, Australia to play with Macklemore at the NRL grand final on 1 October. And I had the opportunity to interview Mary and write a piece for Junkee about it. 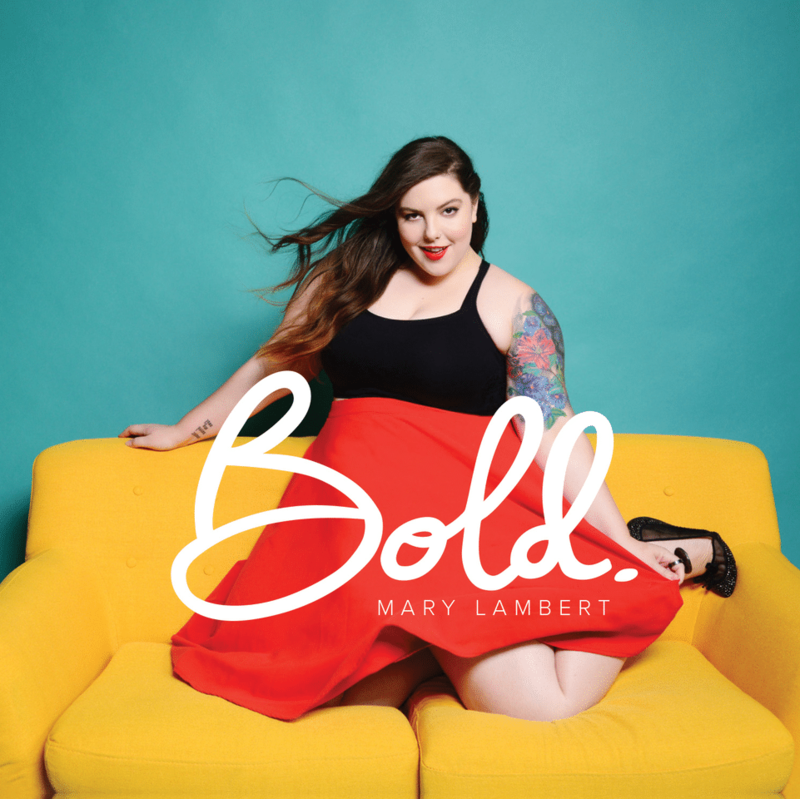 The whole situation has me pinching myself because Mary Lambert was my #1 dream musician to interview. At one point, after I mentioned my own experiences as a queer writer and activist, and my struggles with mental illness, Mary said “I feel like we are kindred spirits.” OMG. Don’t worry, I didn’t overshare too much. 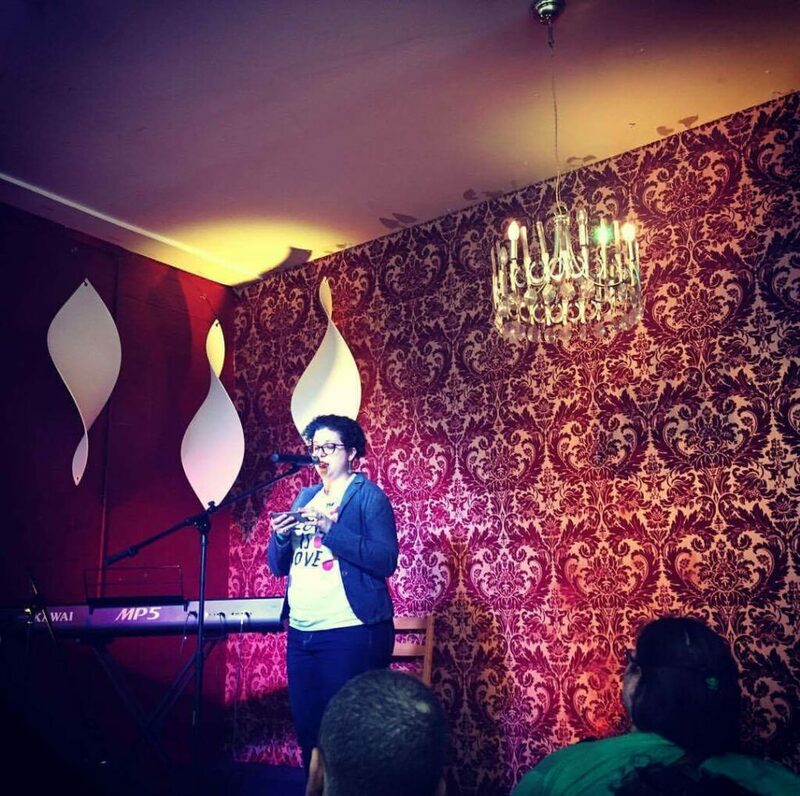 I performed at several events in September. Thank you so much to those who came along and supported marriage equality, queer performers and the Fringe Festival! YES: A fundraising, hoperaising performance party at Hares & Hyenas (63 Johnston St, Fitzroy) on Saturday 16 September. Church (Melbourne Fringe Festival) held at Fringe Hub: Lithuanian Club on Sunday 17 and 24 September. I’m super excited to be a guest on JOY 94.9 FM’s 21st Century Women show at 9pm (AEST) on Monday 21st August. We’ll be discussing the upcoming Marriage Law Postal Survey. You can listen http://joy.org.au/listenlive/. 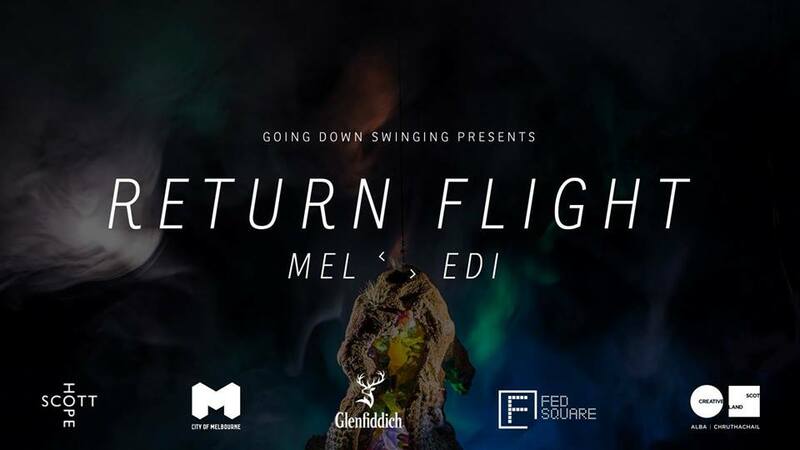 I’m thrilled to be one of the writers involved in Return Flight: MEL>EDI, a cross-continental creative exchange between twenty artists and writers in Melbourne and Edinburgh. I’m amongst writers like Tony Birch and Madison Griffiths, which is an honour in itself. You can buy the book here. 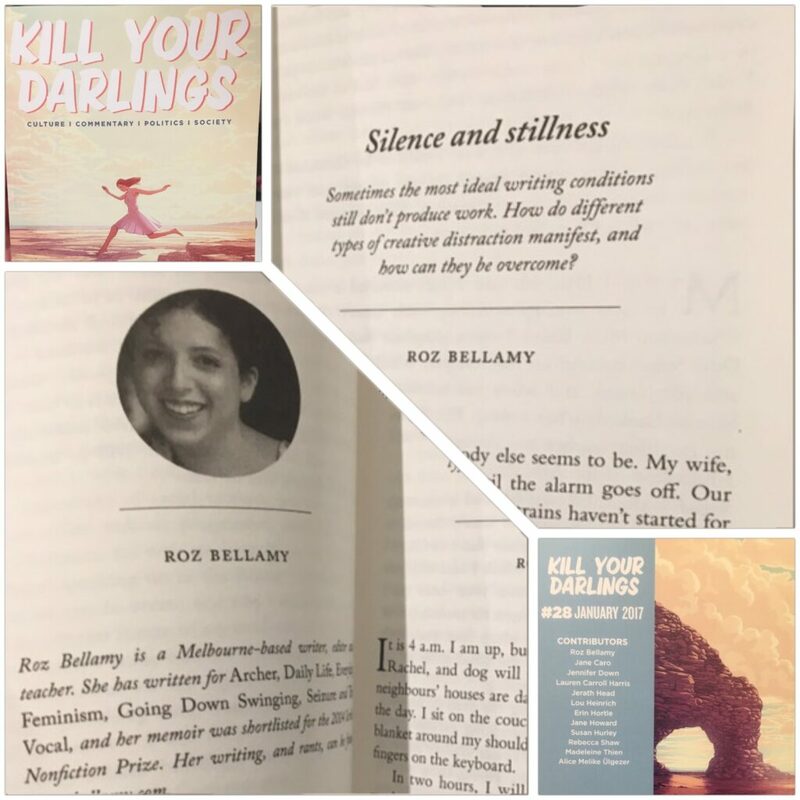 I’ve been a fan of Kill Your Darlings for many years, and I am so excited to have had a piece published in their January issue. My piece is about my time at a writing workshop with Cheryl Strayed in the French alps, which I thought would be the ideal place to escape the distractions of everyday life. The workshop was practical, inspiring, complex, and, in many ways, life-changing. Outside of the workshop room, however, I struggled, even with my dream writing conditions (a view of the Alps, with a cheese platter nearby) to find the peace and stillness I needed. In this piece, I consider what is needed to become fully immersed in creative work: whether it is solitude, collaboration with peers, the privilege to take time off from ‘real life’, unplugging from devices, or a matter of discipline or motivation. You can read the editorial and order Issue 28 here. I wrote about the impact that 90s pop culture had on my developing sexual and gender identity. 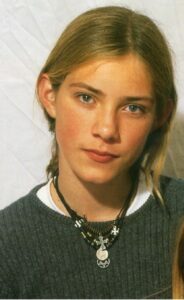 I focus on the beauty of Taylor Hanson, Daniel Johns and Leonardo DiCaprio, and then add in a few surprises. You can read my essay in Junkee.